Cord washed and dried, I decided to incorporate some rope right into the hem of the skirt (hemming and cording all in one? sounds like less work, and I'm a fan of that!). 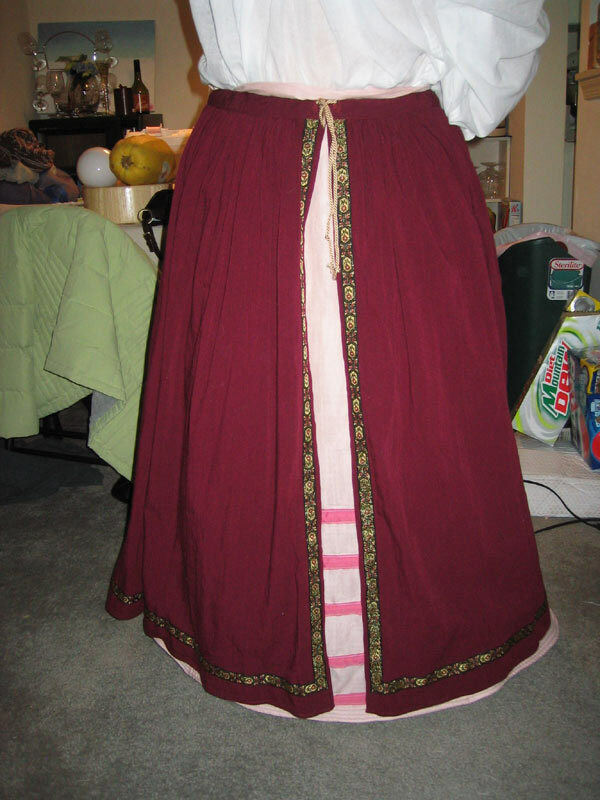 I decided to go with a wide hem, and I sewed 4 lines of the cord right into the hemline. I think it looks kinda space age-y, but cute, and it does add that extra stiffness that I think the bottom should have. In the ribbon channels, I decided to do two cords instead of just one cuz it fit nice and snug and the single cord was a bit roomy. Also, extra stiffness with 2.
assembly--bottom 4 channels in hem and double rope in the ribbon channels. Here's the "finished" product. I may go further up with the channels, but for now I'm outta rope. I can't decide whether to add more or not. Thoughts? i love your petticoat. give it to me. now. just kidding. sort of... but i'm going to be copying the clothesline idea. brilliant! and i like the subtle effect. very nice. so. i am experiencing fabric infidelity. i went to the evil joann's last night with intentions of buying new trim for the existing fabric. and i came home with new fabric instead. oops. back to joann's tonight with a second 40% off coupon to buy the contrast fabric for the bands. Ooooh...fabric spluges are so much fun, though. You'll have to send me a pic when you get around to it...what's it like? Color? Pattern? Fabric type? Ps--petticoat is only "pretty" in front. I nicely hid all the bunched up ribbon parts off to the sides and in the back. Well, at least I tried to. hehe. Excellent. I cannot try (like Beth) to pawn it off of you because it would be capri height on me. Giggle. So pink. So lovely. I have a pink bag in those two colors that I love. Anyways, I think you should not go higher with the bands. They look PERFECT. Any higher and you will reach that point that you might as well rope the entire thing. I think as it is gorgeous and a great feature. You nailed them perfectly. 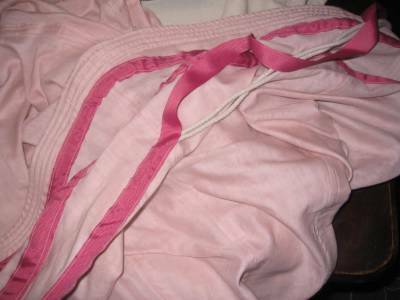 By the way, I am most humored that both you and Beth are into pink now. Beth even seemed to like my new pink yarn! Pah! I should not even humor you with a comment back. anita. i am *not* into pink. not since i was five. jeepers. your yarn is pretty. i probably wouldn't wear the resulting shawl though. it'll look nice on you, and i'll try not to stand next to it in pictures. simple. julie. it's a brocade-ish thing. mostly cream background, one of those random renaissancy (i hope) patterns on the front. the foreground shifts between cinnamon and kind of smoke? it's weird stuff. totally synthetic, but i like the weight, and i think it'll be easier to work with. i'm going to get fake cinnamon silk for the edging. i think that although this isn't as bright as the other one, it'll suit my coloring a lot better. that, in combination with the heavier weight and larger print will turn out better i think. i'll save the crimson velvet for trim on my next gown. 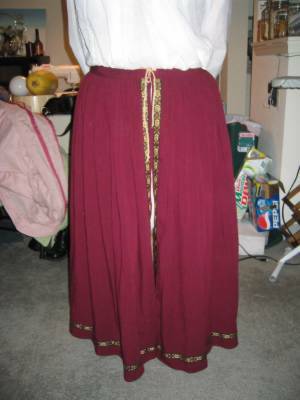 i am thinking dark grey with bands of crimson for an elizabethan. so yes, now i'm psyched to start on the dress. 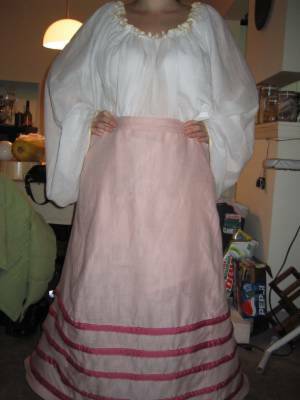 and i'm going to copy your petticoat, using the material that was originally going to line the other dress. very exciting.